M.M. Gottesman, S. Currier, E. Bruggemann, I. Lelong, W. Stein, and I. Pastan, The Multidrug Transporter: Mechanistic Considerations. K. Kuchler, E.E. Swartzman, and J. Thorner, A Novel Mechanism for Transmembrane Translocation of Peptides: The Saccharomyces cerevisiae STE6 Transporter and Export of the Mating Pheromone a-Factor. D.M. Fambrough,M.V. Lemas, K. Takeyasu, K.J. Renaud, and E.M. Inman, Structural Requirements for Subunit Assembly of the Na,K-ATPase. C. Canessa, F. Jaisser, J.-D. Horisberger, and B.C. Rossier, Structure-Function Relationship of Na,K-ATPase: The Digitalis Receptor. P.M. Haney and M. Mueckler, Subcellular Targeting and Regulation of Glucose Transporters. Q. Al-Awqati, J. Van Adelsberg, and J. Takito, Plasticity in Epithelial Polarity. W.J. Nelson, Regulation of Cell Adhesion and Development of Epithelial Cell Surface Polarity. C.J. Gottardi, G. Pietrini, M.J. Shiel, and M.J. Caplan, Synthesis and Sorting of Ion Pumps in Polarized Cells. Subject Index. This volume brings together contributors from several different fields of cell biology, physiology, and molecular biology. The common thread that runs through all of the work presented is that cell processes regulate the activities of membrane transport proteins and classes of membrane transport proteins participate in a number of critical cell phenomena. 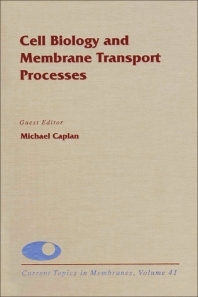 This volume is unique in covering three different members of the ATP Binding Cassette family (MDR, CFTR and STE6) in one place, as well as in including structure and function analysis of the sodium pump in the same forum where its cell biology is considered. The book will appeal to a broad range of biologists with interests in membrane transport, membrane biology, cell biology, and sorting. Cell biologists, biochemists, molecular biologists, biophysicists, oncologists, immunologists, nephrologists, endocrinologists, and all graduate students and advanced researchers with an interest in membrane transport and biology, and sorting. Dr. Caplan studies epithelial cell biology and physiology. His work focuses on the trafficking and regulation of renal ion transport proteins. His group also studies the signaling pathways involved in Autosomal Dominant Polycystic Kidney Disease. He received his MD and PhD degrees from Yale University, having pursued his dissertation work in the Department of Cell Biology under the guidance of Drs. James D. Jamieson and George E. Palade. Following postdoctoral work in the Department of Cellular and Molecular Physiology at Yale, Caplan joined that department as a faculty member. He is currently the C.N.H. Long Professor and Chair of Yale University School of Medicine’s Department of Cellular and Molecular Physiology.